"The Quest, Part III: Blood Moon"
Synopsis: The desert behind them, Morgan and Tara now ride through the jungle, still on their quest to find Deimos--and Joshua. Morgan hopes that the magical crystal he took from Timgad will be helpful in defeating the power of Deimos--though he doesn't know how. Such thoughts will have to wait, however, as the riders come upon (yet another) orange carnosaur. Morgan's horse gets spooked and throws him, so Tara pulls him up behind her. The hungry dinosaur is close behind. When they ride into a wide swath of destruction cut into the jungle, the carnosaur inexplicably gives up and turns tail. That's fortunate for our heroes, because Tara's horse steps in a hole, and breaks a leg. Morgan is forced to put the horse out of its misery with his pistol. So occupied, our heroes don't notice the incredible thing coming up behind them, until it is all but upon them. They turn to see a red, crater-pocked planetoid--a moon--filling the sky as it travels the path it cut in the jungle. Before the two can react, men on sky-sleds emerge from it, and start firing energy blasts at them. Our heroes manage to destroy a few of the craft, but first Shadow falls, then her owners. Beams from the remaining sleds lift them and carry them into the moon. They awaken in the presence of the eccentrically dressed Bornaa. He explains that what Morgan took for a moon is actually the cratered, protective shielding of a starship from the planet Alces Shirasi. 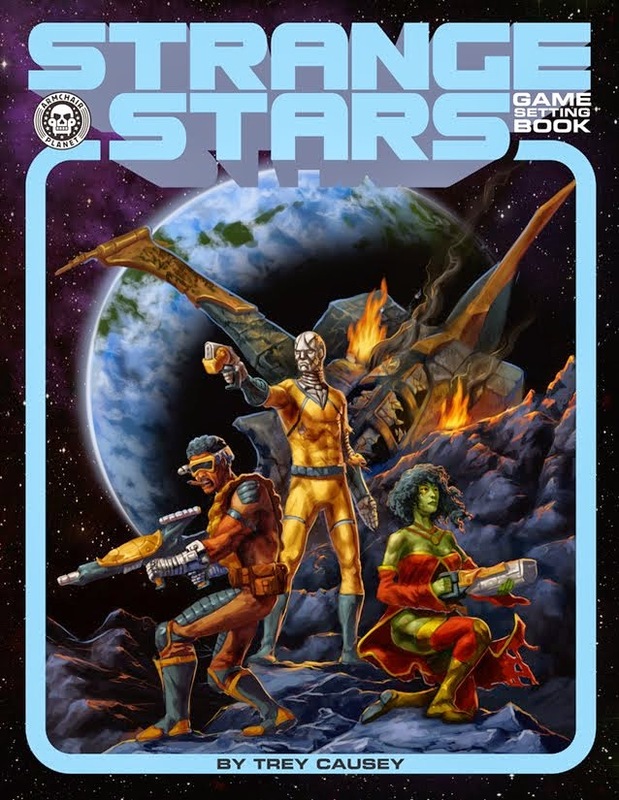 The crew is all that remains of their billion year-old, interplanetary civilization, destroyed when their sun went supernova. In truth, they are the descendants of those last survivors, who were forced to cross-breed with humans, captured and genetically transmutated for that purpose. Now, they are close to being able to breed with unaltered humanity, and then they will be able spread their civilization and culture throughout Skartaris. Bornaa expects Morgan and Tara to take part in his people's plan. Morgan declines--and not so politely, as he leaps forward to throttle Bornaa. Our heroes try to flee, but Bornaa manages to trap them in a force field. They lock Morgan in their transmutation machine. "If he insists on acting like a savage beast," Bornaa explains to Tara. "It's only fitting that he look the part as well." 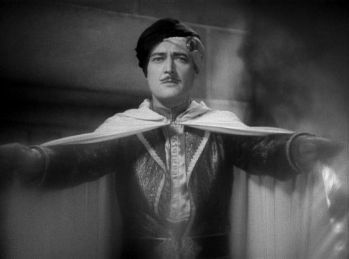 Bornaa leads the horrified Tara away, and the machine turns Morgan into a bull-headed creature. As his rational mind slips away, his strength surges and he breaks free. Meanwhile, Bornaa is putting the moves on Tara with lines like: "I am much higher on the evolutionary scale." Tara plays along only long enough to steal his pistol and blast him. She runs back to save Morgan, and finds him fighting the crew, raging bull style. 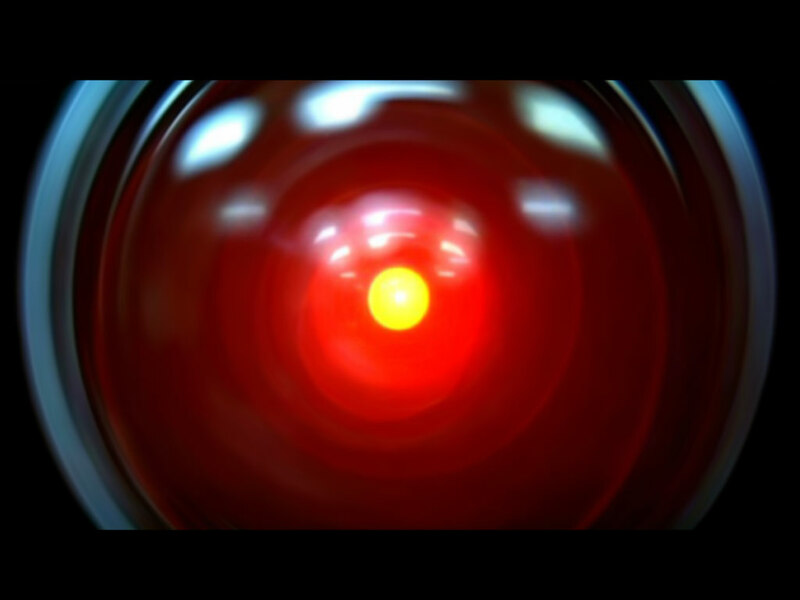 The voice of his beloved Tara soothes the savage beast and gets him back into the machine so the technician (at gun-point) can return him to normal. The two free Shadow from a nearby cage, then escape on sky-sleds. An overzealous guard tries to stop their escape, but misses and hits the ship's reactor instead. Morgan and Tara escape, but the starship explodes as they look on from a distance, marking the final end to the Shirasi people. Tara misquotes Saaba--she says the witch told them they could find Deimos "in a place of eternal shadow," but what she actually said was "a place of half-light, half-shadow." Shadow, Tara's dog, is still with the pair. 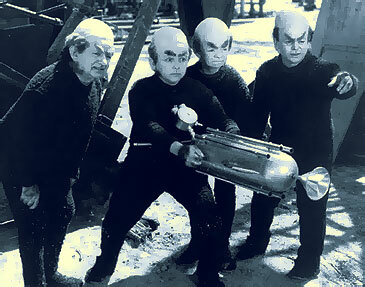 The Shirasians may have pioneered that fundamental of United Federation of Planets chronometry--the stardate. "Blood moon" is another name for the "hunter's moon" which is the first full moon after the harvest moon (the full moon nearest the autumnal equinox). The use of a stardate in the Star Trek style, points to this issue's possible inspiration in the original series episode "For the World is Hollow and I Have Touched the Sky" which features a generation ship that appears to be an asteroid. 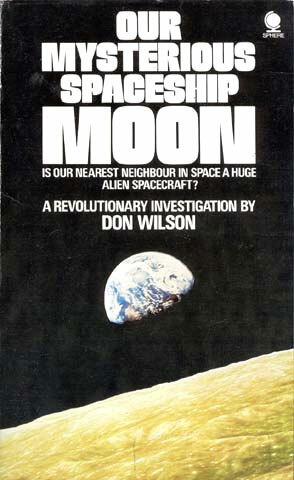 It's also possible that the idea that our moon is actually an alien spacecraft was at least part of the inspiration. This is the so-called "Spaceship Moon Theory" proposed by Vasin and Shcherbakov in a 1970 article, and popularized by Don Wilson in the 1975 book Our Mysterious Spaceship Moon. Grell engages in a bit of a joke with the name of the alien invaders. "Alces Shirasi" is the species and subspecies name of the Shirasi Moose (Alces alces shirasi), the smallest species of moose--native to Morgan's home state of Wyoming. Perhaps this is sly reference to their penchant for human-ungulate mash-ups, or either Grell just thought it sounded cool. 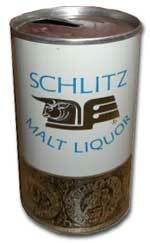 Morgan's quip about being able to do beer commercials in his minotaur form references the famous Schlitz Malt Liquor TV ad campaign, beginning in 1972, that features a black Brahma bull rampaging through any place a Schlitz is opened. Morgan, having been in Skartaris since 1969, would be unaware of this bit of pop culture, but his line is not necessarily an anachronism since Schlitz Malt Liquor had featured a Minoan-esque bull-head on its label since its inception in 1963. In my post last week on the dread anarchists of the world of the City, I mentioned that certain strange cartoons might serve as some sort of awakening to mindwarping alien influences. 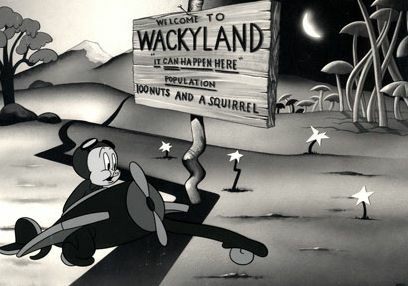 Other cartoons of the era that are no doubt symptomatic of chaos god-thing intrusion into our plane (in the most entertaining way) are "Russian Rhapsody" (1944), "Porky in Wackyland" (1938) and its color almost- doppelgänger "Dough for the Do-Do" (1949), to name only a few. This past weekend I got DC's Wednesday Comics oversized (over 17' tall and 11' wide) hardcover. Wednesday Comics was a 12 issue weekly series published in broadsheet format to harken back to the Sunday newspaper comics section. 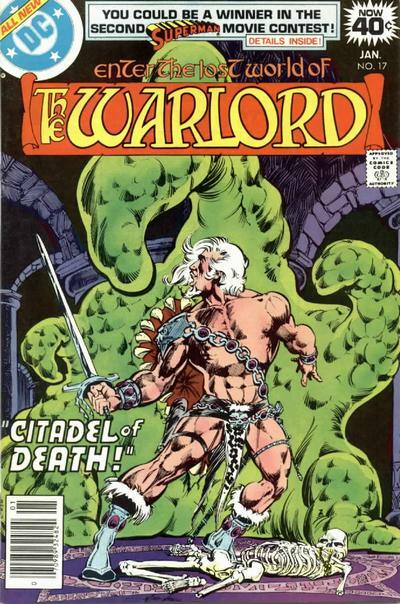 It was an anthology with serialized stories featuring the usual suspects (Batman, Superman, and Wonder Woman), but also some lesser lights (Adam Strange, Metamorpho, and Kamandi). Of interest to the matter of this blog, at least a few of the strips veer more into non-superhero fanatastic genres. Probably my favorite is Kamandi, The Last Boy on Earth by Dave Gibbons and Ryan Sook. They keep Jack Kirby's basic post-apocalyptic boy-meets-Planet of the Apes premise, but reinterprete its aesthetic in a Hal Foster's Prince Valiant-ish vein. The result is the most classic comic strip styled peice of the collection, and simply gorgeous. "...Why, they resemble nothing less than the mandrillus sphynx monkey of the family cercocpithecidae...Only huge, blue-furred, and operating strange flying machines. The sight would be patently absurd if it wasn't so horrible!" There are other good strips: Gaiman and Allred's sixties-homage Metamorpho story, Bullock and Heuck's demon-fighting Deadman, and the time travel Flash story makes good use of the format. But there are also several that just don't quite come together--like the Batman and Superman stories, and the Metal Men strip. The other drawback is the height of the collection itself--at nearly a foot and a half, its too tall for most shelves, at least upright. 1. Well-known loanshark Arman "The Brain" Rothwald looks none too happy--and neither do his two out-sized friends. Someone owes him dough and hasn't kicked it back, and The Brain's outsized friends tend to resent that sort of thing. 2. A beautiful, dark-haired dame in a blood red evening-dress walks by and everybody takes notice. There's a whiff of brimstone as she passes. 3. A police prowl car creeps by outside the window. There's no one inside. 4. Two dirty hobogoblins try take a seat, but are tossed out by the staff. One shakes his fist and warns that the King in Tatters is coming to deal with all you swells. 5. A torch-singer is trying to look inconspicuous as she seems to be waiting for someone. The cloth-wrapped parcel sitting on the counter next to her may have just moved. 6. 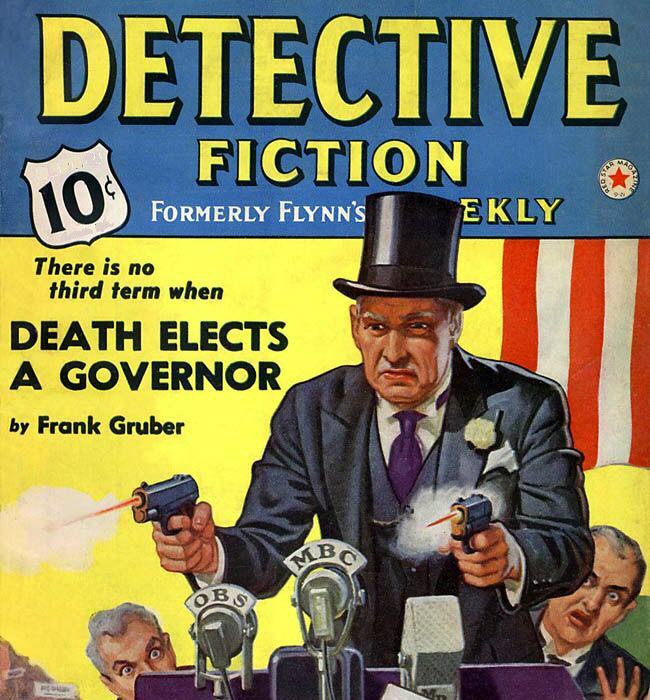 Professor Wickenwyre, a prominent inventor recognizable from the papers, sits nervously at a booth with two strangely-accented bruisers in trench-coats and fedoras. 7. A wizened hermit from the Far East, proclaims loudly that he is looking for the student to whom he is fated to teach all his secrets. The signs say he is to meet that student tonight. 8. A pale, blank-expressioned little girl carrying a teddy bear walks up and silently holds out a black envelope. 9. 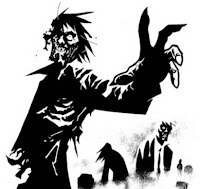 The well-known moll of a murderous gangster talks in whispers with a known newshound, only the moll's corpse was pulled from the Eldritch five days ago. 10. 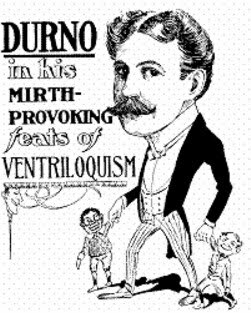 A shabby, Vaudevillian ventriloquist and his dummy have an argument that gets increasingly heated--until the ventriloquist lies stabbed and bleeding, and the dummy is nowhere to be seen. 11. A Hilly-billy giantess (8ft. tall) in a gingham dress sits crying, a battered suitcase hugged tightly to her. 12. A disheveled tough guy with nervous, darting eyes, holds his right hand in his left, like he's protecting it. He keeps whispering conspiratorially into an large, antique ring he's wearing. 13. In the street outside, a procession of ten or so showgirls in full costume bop along glassy-eyed behind a satyr blowing a crazy tune on a set of bone pipes. 14. A natty stage magician in tux and tails takes a seat. He's amnestic..and he has a fist-sized hole in the center of his chest to--elsewhere. There's no blood, but tendrils of smoke rise from it, and raspy, malevolent whispers can be heard from within the darkness. 15. An ugly and dwarfish professor-type walks in carrying a large jar full of a yellowish liquid and dragon-like animal. He asks if anyone has seen "M'Gurk." 16. For a minute and a half, a static-y, but intelligible, firebrand sermon from a radio evangelist can be heard. There is no radio. 17. A blonde in a khaki explorers outfit, carrying an over-sized rifle, sticks her head in the door and asks (out of breath) if anyone's got fifty-foot of rope. 18. A police detective named Faulke, flanked by five uniforms, comes in and arrests someone. 19. A veiled, exotically dressed woman and her stern, bearded and turban protector ask for directions to an infamous opium den. 20. An imp in a tux, spats, and monocle appears in mid-air with an audible "pop" and issues a challenge in a supercilious tone. 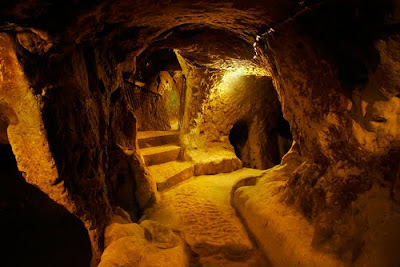 There are real dungeons in Turkey. Or at least, there are the sort of underground environments gamers would call "dungeons"--over 200 underground cities, containing a minimum of two levels, known to exist in the Eastern Anatolian region of Cappadocia. 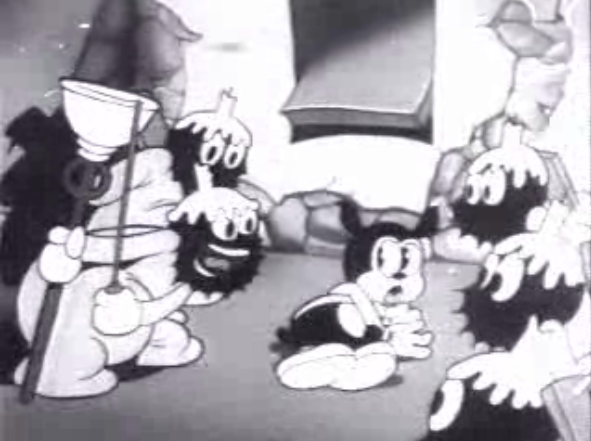 The cities have had a series of residents, apparently, but the delving got started with the Phrygians (they of the Smurfish caps) in the Bronze Age. They were later expanded by persecuted Christians hiding out from the Romans. The other prominent site is Kaymakli. 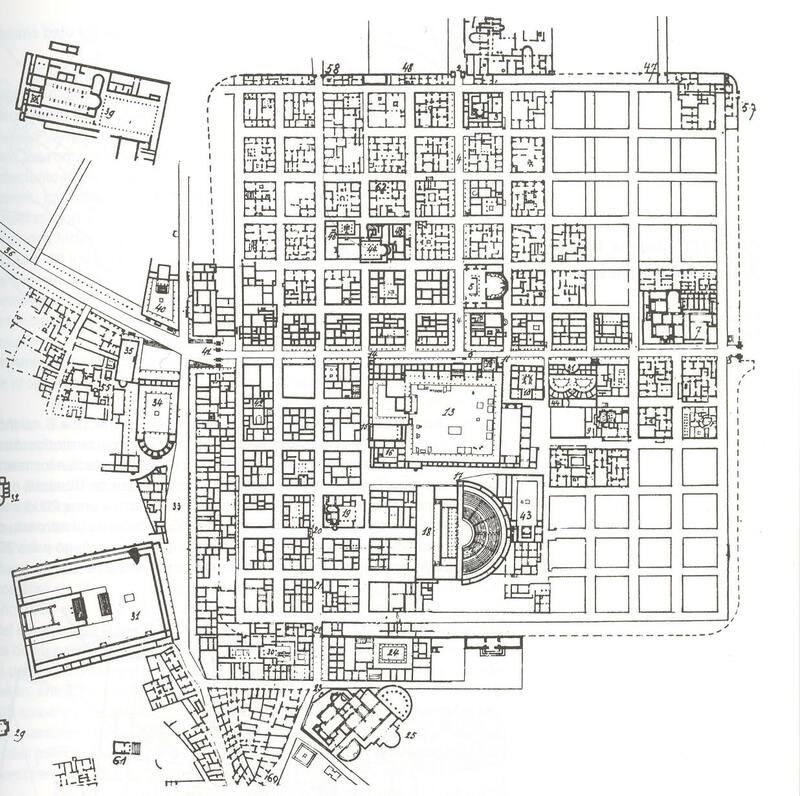 It's smaller, and differs in structure from Denrinkuyu. It's tunnels are narrower, lower, and have a steeper incline. The overall layout is more labyrinthine--with a number of deadend tunnels--possibly to confound intruders. It has seven levels, though only four are now open. In preparing this post, I found an article from Dragon #201 by Allen Varney on these cities on his website. He gives some great description from actually visiting there. "Then mankind would have become as the Great Old Ones; free and wild and beyond good and evil, with laws and morals thrown aside and all men shouting and killing and revelling in joy. Then the liberated Old Ones would teach them new ways to shout and kill and revel and enjoy themselves, and all the earth would flame with a holocaust of ecstasy and freedom." - H.P. Lovecraft, "Call of Cthulhu"
Almost as feared by the denizens of the City as the Reds, are the Anarchists. Before the War, they were probably even more feared. Yet the Anarchists are even less understood, if possible. 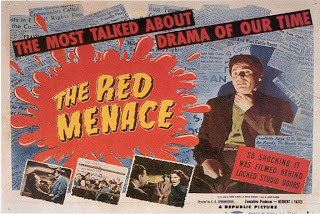 Few have guessed at the true motives of the forces behind the mad bombers of popular imagination. 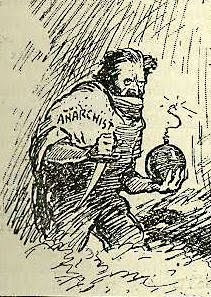 "Anarchist" is actually a term used for a wide variety of groups. Some are largely peaceable groups, philosophically opposed government. Others are absurdist or surrealist artists dedicated to breaking down authority in a variety of ways. The ones that get the most sensationalistic media are terrorists attempting to destabilize governments by destroying the populous' faith in said government's ability to protect them. All of these groups are fertile recruiting grounds for the most insidious and dangerous faction. The truth is that anarchist philosophy and action are secretly promoted and supported by extraplanar forces. Anarchists claim communion with beings of raw chaos, crippled and lobotomized by the irruption of crude matter and banal casuality into their realm. These ultimately formless beings, are often portrayed (or disguised) in anarchist works as vaguely unsettling frog-like creatures, or sometimes seemingly innocuous cartoon characters of various sorts. These beings want nothing so much as to destroy the irritant that is the Prime Material Plane. Why would any intelligent person choose to serve these nihilistic creatures? First, since the chaos null-gods have no concept of time, their victory may be temporally remote enough for anarchists to enjoy the benefits of their service for quite some time. Second, a lot of anarchists have been driven utterly insane by their brushes with their master's alien minds. Part of this madness may be caused by the alien code called aklo, which is learned by all anarchists during their initiation into the secret doctrine. Aklo allows them to decode the messages from their fellows and from their null-gods--often found in nonsensical graffiti, banal but odd posted signs, and surrealist/absurdist comic strips. The mental restructuring it causes is also the source of the ability of advanced adepts to manipulate magical energies with frightening power. Anarchist initiates and potential recruits may serve or aid anarchist masterminds in their various schemes, which are often ill-conceived and needless complicated, but always promote fear and sow discord. Masterminds are a diverse lot (their masters place no premium on conformity, after all)--some appear as scientists others masquerade as normal criminals, while still others dress and act like sorcerers out of old legends. Anarchism is more popular in Ealderde, particularly in the east, but Anarchists have been known to effect outrageous accents, regardless of their true origins. Symbol: A featureless black flag, or a stylized eye. Special Benefits: The induction into true anarchism is the learning of aklo--which allows interpretation of anarchist messages and communication with the chaotic null-gods (Aklo can't be learned without becoming an adherent of the chaos beings, attempts to do so will lead to conversion). More advanced followers may develop boons, which are magical powers which often take on an unwholesome or disturbing manifestation. 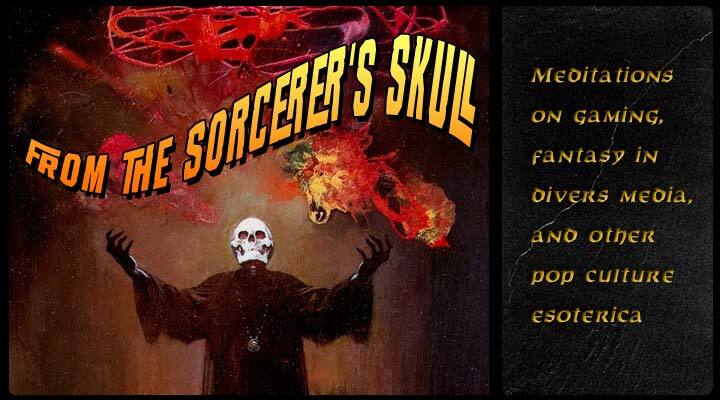 Anarchist magic-users essentially become something like 3e sorcerers--they don't require memorization or spell components. However, every spell casts requires the caster to make a saving throw, with every failure resulting in some sort of physical manifestation (a skin lesion, tic, change in color of one eye, etc.). Every two failed saving throws in a row deal 1d4 points of damage. One of these manifestations will "heal" for every 24 hours without magic use. Any game effects of the manifestations are at DM discretion. "The Quest, Part 2: Citadel of Death"
Synopsis: Morgan and Tara cross "500 kilometers of trackless, blistering, desert waste" in their search for their infant son, Joshua, kidnapped by Deimos, the "devil priest." Morgan is worrying about what will happen if they don't get water soon, when serendipitously, Tara sights a city in the distance. Arriving at the city, they find it deserted. When Tara sees a golden statue of giant, grasping hand, she realizes that they've stumbled into Timgad, The Citadel of the Sorcerer Kings. 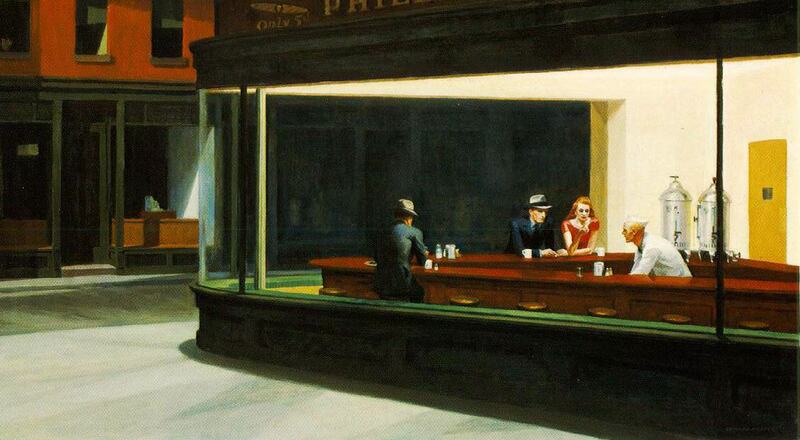 She remembers the legends that tell of the city so evil that "the vultures shunned it." A city from a forgotten age before man, when Skartaris was a place of wizard, ogres, and elves, divided into warring city-states. In the present, Morgan and Tara find water, but are set upon by leonine (or perhaps baboonoid?) humanoids. The beasts are too many, and Morgan and Tara are forced to flee, unknowingly following the path taken by Ogir ages past. A pounce from a creature, sends Morgan through the same trapdoor and into the darkness below. Above, Tara fights on against worsening odds. In the pit, the glow of the small cask dropped by Ogir attracts Morgan's attention. Using the cask as a torch, Morgan tries to find a way out of the pit. Instead, he comes across a skeleton he can't know is that of Ogir inside a mystical symbol drawn on the floor. Morgan guesses that whoever he was, he drew the circle to protect himself, preferring to starve than fall prey to whatever dwelled in the pit. Morgan continues to search for a way out, but when he hears a wet, slithering sound behind him, he realizes that something still dwells there. He soon finds himself facing a tendriled, ameboid creature, unfazed by his sword. Morgan runs back to the mystic symbol, and finds it still holds the creature at bay. Examining the cask, he notices the glyphs on it match some of those inscribed in the symbol around him. He opens the box and finds an emerald fragment complementing the one hanging on a chain around the neck of the skeleton. On a hunch, he puts the two fragments together. There's a blast of searing radiance from the gem, and the creature is burnt to nothing, but Morgan is unharmed. He resumes his frantic search for an exit, and soon finds a stairway. Morgan bursts through a doorway, and finds Tara still holding her own against the beasts. Holding the gem aloft, he again uses its magical radiance, this time to send the beasts running. He and Tara are free to contine on their quest, now with a powerful artifact that may be of use against Deimos. This is the first glimpse we get of Skartaris's "Wizard World" past. Despite everything he's seen is Skartaris, Morgan seems to find the former existence of elves and goblins difficult to believe. The Hellfire Gem is named in a caption, but the story's characters never learn it. Timgad is the name of a North African city founded by the Roman Emperor Trajan circa 100 AD. 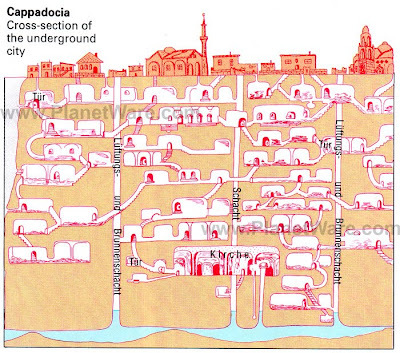 It was finally abandoned after being sacked by the Berbers in the 7th Century, and was swallowed over the centuries that followed by the encroaching Sahara. It had been forgotten by history until it was excavated in 1881. The name "Ogir" perhaps derives from "Ogier the Dane" a legendary character from the French chanson de geste, or it may have just been suggested by the word "ogre." Except for his red skin, Ogir Falconeye's appearance is informed by traditional portrayals of elves (Santa's elves, Keebler elves, Marvel's Elf with a Gun), pre-Tolkien influence. Not only have I never played with anyone that had read all of the famous Appendix N, but in my gaming history spanning over twenty-five years, I've played with very few who were particularly avid readers of fantasy, period. In my high school gaming group, a couple of the guys read some of the Gord books and other early D&D fiction, and maybe one of them read some Raymond Feist stuff. In my current gaming group, one of the guys is a big Tolkien fan, and another read a bit of fantasy in his youth including Conan and Elric, though that was years ago. The third guy I don't think has read any fantasy--unless maybe the Harry Potter series. Anyway, maybe my experiences are atypical, but if the people I've played with are in any way representative, I was suspect most gamers don't come to rpgs with a strong background or even particularly strong interest in fantasy literature of any sort, much less many of the more obscure writers in the Appendix. Perhaps this is due to changing entertainment patterns compared to Gygax's day--certainly studies show that reading in general has decreased in every age group compared to 30 years ago, but I've noticed the phenomena before that trend. So what gets gamers into gaming? Well mostly their friends, I'd guess. But why fantasy gaming, then? I assume this is tradition--"rpg" has mostly meant "D&D" over the years, so people had little choice. Many, perhaps most, peoples touchstones for how to conceptualize fantasy worlds and characters, then, has come largely from the game itself. I should add here that I'm not placing any value judgement on this. There's no "wrong way" in my mind for people to enjoy rpgs, or to get into gaming, nor is there any purity test for inspirations. But I find it interesting--particularly this: Do player's who've never read a fantasy novel, but came to tabletop rpgs from say, computer games, have different expectations or approaches to gaming, than those weened on Howard, Moorcock, and Leiber? How about those who got there from He-Man cartoons, or BOC albums, or those whose sole source of knowledge for fantasy is what they gleaned from the Player's Handbook and Monster Manual? My gut reaction is that the conventions and culture of the game are the great leveller here, but I wonder what others have observed in this regard. "The nightmare is deepest during the storms. But on the occasional bright day and the usual gray day we cannot shake from it. We live with the dust, eat it, sleep with it, watch it strip us of possessions and the hope of possessions. It is becoming Real." The past decade has seen the Western prairies between the cities of the Steel League and the the Stoney Mountains become choked by dust. Over-farming and relentless drought left the topsoil with nothing to hold it in place, and so it blows across the land in large, dark clouds, giving the area its nickname, the Dustlands. The blighted land has given rise to twisted and wrathful elementals--malign spirits in the form of dust devils, and even cyclones. They crisscross the land, warring with each other, the strong consuming the weak and adding the substance of the vanquished to their own, growing larger in the process. 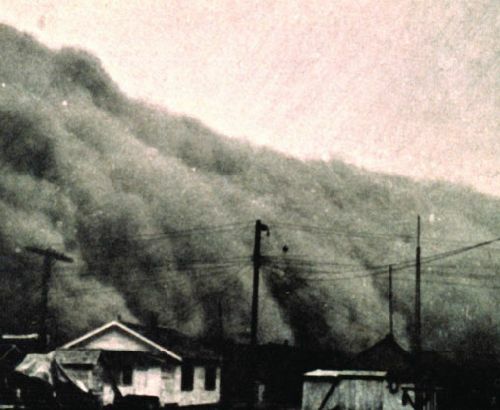 The big storms terrorize the isolated dirt-farmers and small communities that remain. They demand tribute or sacrifices, and sometimes even worship, in the manner of ancient gods. Would-be adventurers, and often opportunistic grifters, roam the Dustlands offering to free the oppressed folk from the yolk of the tornado tyrants. Sometimes these champions meet their deaths in the howling winds that scour flesh and fill lungs. When they succeed, the farmer-folk often just exchange one overlord for another. Even the cyclone bosses go to ground when the black blizzards come. These are elementals, too, but tainted. The thaumaturgic horrors unleashed in the Great War, had an unforseen backlash. The primal elements were partially corrupted by entropic energies. The birth-trauma of the creation of these black-dust elementals has driven them hopelessly insane and caused them to lose all power of reason. They live only to destroy, descending on living things and blinding, then suffocating them--but only after a period of terror. Their energies being inherently unstable, they don't survive long on this plane--usually only a matter of hours, at most days--but that's more than long enough to bring death to the unwary. A mysterious stranger arrives in town. Only working at night, and with no apparent help, he constructs a structure of megalithic stones. The stones are often carved in odd designs, some perhaps with arcane significance. When asked how he moved and worked the stones, the stranger only made veiled references to ancient secrets. The construction lasts nearly thirty years, until the stranger succumbs to a wasting sickness. Sounds like the background fluff for an adventure, doesn't it? But it happens to be true. 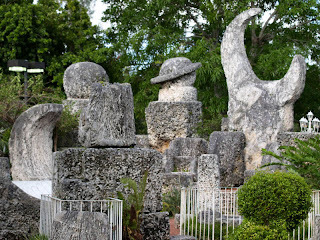 While not technically a dungeon, Coral Castle has enough mystery to be the inspiration for a interesting game adventure locale. Edward Leeskalnin (1887-1951) was a Latvian emigrant who arrived in south Florida in 1919. 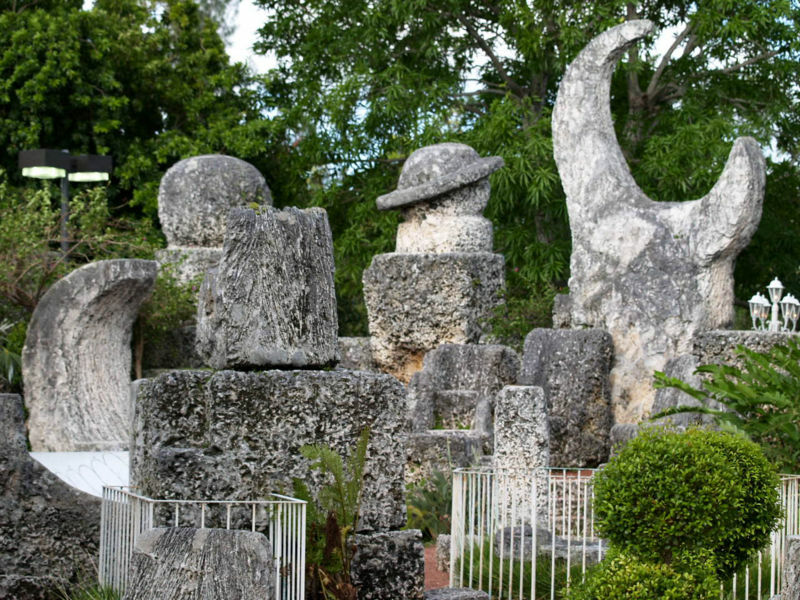 He purchased a small parcel of land, and spent the next 28 years building a structure of megalithic stones (mostly limestone formed from coral) in homage to his "Sweet Sixteen." 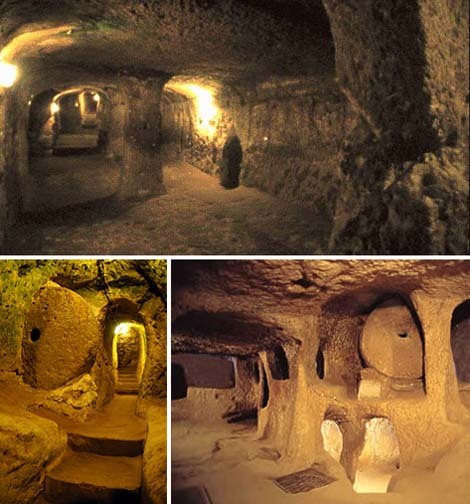 How he cut and placed the 1000 tons of stones that make up the structure is mystery. He never let anyone watch him work (he supposedly did much of the work at night, by lantern light), and never had any help or used any heavy machinery that was seen. This secrecy has, of course, allowed a lot of speculation about his methods over the years. Leedskalnin supposedly told people that he "understood the laws of weight and leverage well", and more enigmatically, that he had discovered "the secrets of the pyramids." He also supposedly spoke of using a "perpetual motion holder." 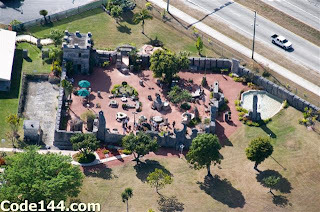 "...a two-story castle tower that served as Leedskalnin's living quarters, walls consisting entirely of 8-foot high pieces of stone, an accurate sundial, a Polaris telescope, an obelisk, a barbecue, a water well, a fountain, celestial stars and planets, and numerous pieces of furniture. The furniture pieces included are a heart-shaped table, a table in the shape of Florida, twenty-five rocking chairs, chairs resembling crescent moons, a bathtub, beds and a royal throne." In a game setting, the strange stone structure could be the remains of an ancient pre-human culture, or a gate built by a wizard to another world, or the only visible part of a Brigadoon-like city that only appears in this dimension every so many years. Of course, in a pulp setting, one could use the real coral castle for adventure fodder--and perhaps have a run in with its real-life mysterious and reclusive wizard. See Rock City...If You Dare! You might rightly ask yourself: surely Trey isn't seriously going to suggest that Lookout Mt., Georgia's kitschy, but slightly trippy, roadside attraction might have an analog in the world of the City (and perhaps elsewhere) that could be an adventure local? There are stories from the Southern end of the Smaragdines about a strange place atop a mountain inhabited by extraplanar beings. It's become something of a legend across the rural South. 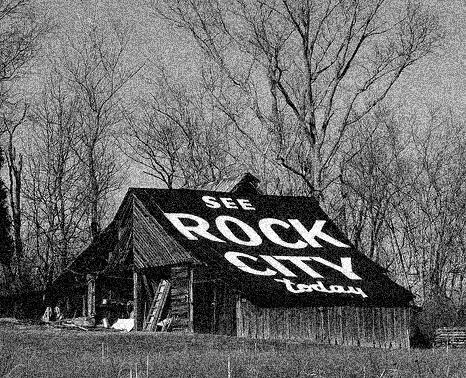 Many barns or abandoned shacks along dusty roads and lonely highways are adorned with cryptic references to its wonders, or exhortations to "see the rock city." The Natives of the land told stories of this place, and made visits to pay superstitious homage. 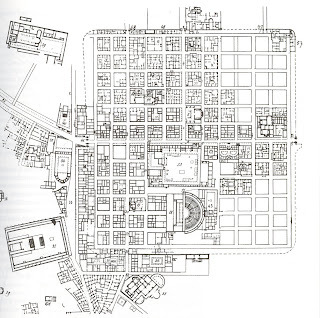 Early explorers from Ealderde described a natural fortress of rock, with its components arranged so as to form the semblance "streets" and "alleyways"--and then there were oblique references to reclusive inhabitants. By the time the area had been well-settled, stories began to circulate of disappearances, and strange lights and music in the city of rock. Some Old World immigrants began to whisper about entrances to Fairyland. Scientific thaumaturgical inquiry toward the end of the last century appears to have solved the mystery. In the heart of the rock city, reached only after passing through a maze of unusual rock formations, is a cave. The cave is the domain of clan of ultraterrestrial entities called gnomes. Gnomes are elementals of earth. On the surface, they often appear as statues, as their experience of time isn't ours, and they sometimes stand immobile for long periods of time before springing to sudden action. They travel from the subterranean depths via veins of minerals. Their purposes are often inscrutable. In the rock city, they appear to be attempting art. The gomes look like statues of bearded little men, with often comical expressions, and have shaped some of their substance to look like human clothing--brightly color through the expression of mineral pigments. This is not unusual gnomic behavior. What is, is that in the rock city, that have turned grottoes in their cave complex into dioramas, glowing with eerie, otherworldly light. These dioramas are scenes from Old World fairytales and nursery rhymes. The gnomes, it seems, have some knowledge of their audience. 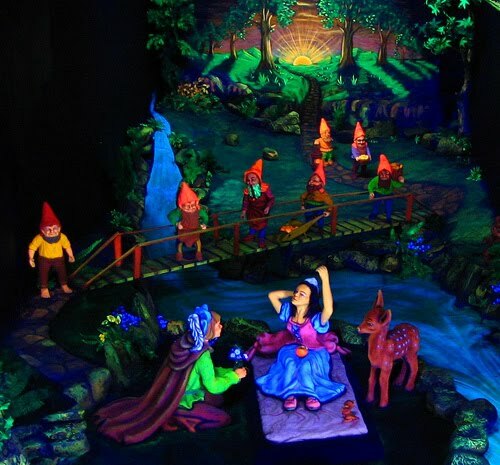 It's for these strange and whimsical dioramas that people visit the rock city. But before making the trip yourself, consider where the non-gnomish statues in the dioramas come from. Some experts hold these are gnomes, just assuming different forms. Others point to the unusually high numbers of disappearances in the area and suggest the the gnomes may sometimes need human stock for their quaint designs. As a companion to Tuesday's post, I wanted to give a couple of examples of magic-using character concepts from the world of the City. First though, a word about magic in general. The divide in this world is not so much cleric vs. magic-user (though, a similar divide does exist, in a fashion) but thaumaturgy vs. mysticism. Thaumaturgy is the applied science of magic, the exploitation of forces and principles as real as physics or chemistry are in our world. There are many competing models as to the "hows" and "whys" of magic, but whatever their differences, they all typically involve spells/formulae, magical aides/tools, and experimentation. Mysticism, on the other hand, is less rational and more intuitive. It relies on idiosyncratic (or even lack of) explanations. It's tools are things like meditation, physical conditioning, and/or use of drugs to create altered states of consciousness to achieve sudden insight. Nightshade's got a one-room office with "Nightshade Investigations" stencilled on the door. He solves problems. Particular sorts of problems. Kinds the cops won't. He used to be a cop himself, but that was before the War. Then he had uniform and a badge. Now he's got trouble sleeping nights--and magic. He used to think he was just lucky, but luck had nothing to do with it. The ageless man that visited him in that hospital overseas clued him in, and gave him a book--a grimoire--the first of many. The upside of insomnia is a guy's got a lot of time to read. The so-called "Gentleman Mentalist" is a highly-paid performer and celebrity exposer of criminal mages. He dates starlets and popular songbirds, and appears in advertisements for pomade, cigarettes ("Djinn Cigarettes--your wish for flavor is granted!") and men's shirts. This public persona doesn't tell the whole story. His real name is Alisander Welleran and, despite his image, he's taken an oath before the Nine Unknown Sages of Agarthala to defend this plane against the forces of evil. Time after time, he's put the mystic powers he mastered in Agharthala to this purpose--and if he can increase his celebrity thereby, so much the better. He's thwarted Anarchists trying to poison the City's water supply with flesh-warping alchemicals, and bested a murderous shade striving to re-enact its pre-death killing spree, among other exploits. And he's always looked good doing it. 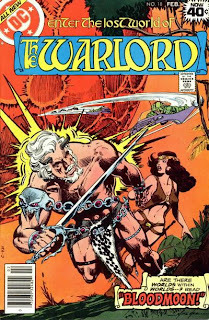 Work obligations got me home late, so no issue review this week, but I thought I'd present the Warlord art from Who's Who: The Definitive Directory of the DC Universe. The Who's Who began publication in March 1985, and finished in April 1987. It featured files of most of the major Warlord characters, most with art by Mike Grell. Skarataris also got a two spread with a map. Here are the pictures accompanying the entries of the characters that have appeared in my review so far. All of them are by Grell, except Mariah, who was drawn by Ron Randall--a post-Grell artist on the series. Or actually, one tough guy and one tough gal. A former Freedonian Ranger who hunted bankrobbers, banditos, and monsters along the Southwestern border, before "retiring" to the City to open a speakeasy. Going into business didn't mean Hazard had to put down his guns--he just meant he went freelance. He and his boys rescued the debutante daughters of the old money from ritual sacrifice by the sinister sorcerer, Wu Fang, and busted up a plot to hold the City for ransom with a threat to release War-surplus cloudkill in the subway. He helped clear the hobogoblin jungles in the Steel League, and stopped the Reds from replacing City ealdormen with dopplegangers. He even tangled with the Wurm at one point, but that one even he couldn't win. He made it out with his life, but left some good men underground. Hazard eventually ran for public office, but didn't win, and went back to his bar in defeat. 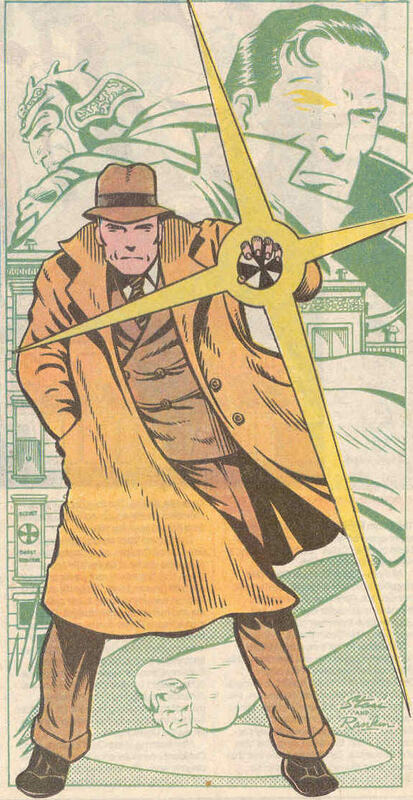 Still, taking out a Hell Syndicate Hit-Fiend during a live radio broadcast has got count as some sort of victory. 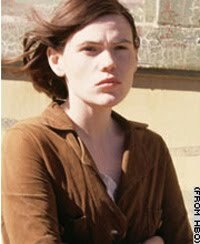 Nineteen years-old, and already making her own way for several years in the bleakness of the Dustlands. Gunn is an ace mechanic, and handy in a scrap. She's been with a gang of adventures for a couple of years, defending refugees and isolated towns from road agents, black-dust zombies, and violent cyclone bosses looking to expand their territory. Between all this "do-gooding" they raid old Native mounds for treasure--mostly magical materials, but a little gold and silver, too. There are trains to be guarded, too--a few days riding the rails from Lake City to the Stoneys, looking out for thunderbirds and as always, malevolent elemental storms. Mostly sullen and not much for conversation, Gunn is given to almost berserker rages when she gets riled. Her favorite weapon is an over-sized wrench (rumored to be imbued with magic by a Native shaman--or maybe forged from adamantine scavenged from the sword of an ancient, Old World king, stories differ) that's cracked more than one skull of a would-be hardcase who's underestimated her. Are You Ready for the Great Atomic Knights? "World War III--The Great Atomic War--is over...And in its wake lies an earth in ruins! Of plant life, there is none! Of animal life, only a small number of humans lingers on! There is no government and the prevailing law is might makes right!" - Strange Adventures #117, 1960. As you recall, unless you've been afflicted with the h-bomb radiation-induced amnesia, there was a terrible atomic war in October of 1986. No? 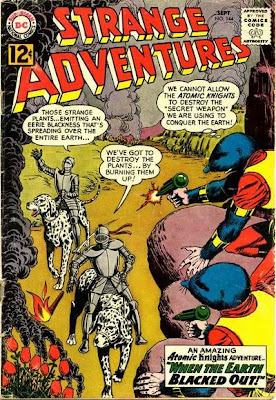 Well, then you don't inhabit the odd--and oddly optimistic--post-apocalyptic world of John Broome and Murphy Anderson's Atomic Knights, recently collected in one hardcover volume. The tale of the Atomic Knights begins in Strange Adventures #117 (June 1960). Amnesiac Gardner Grayle is running from smartly-groomed, but otherwise degenerate post-apocalyptic survivors (think the folks in The Road with more Brylcreem and Burma-Shave). Luckily, Grayle comes across a newspaper that jogs his memory about the recent nuclear holocaust, and reminds him of his one brush with fame--a news piece describing him as utterly average in every way. A lot of people would take this one-two punch of global and personal setbacks as an excuse to give up, but not our Grayle. He finds a few other survivors, and they decide to strike a blow against the local strongman. 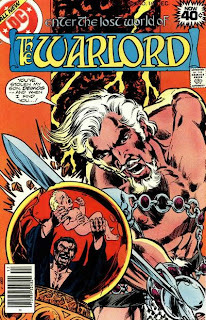 The group includes Douglas Herald, a former teacher, Bryndon, last scientist on earth, the Hobard Brothers, and Marlene, Herald's sister, and eventually Grayle's lover interest. 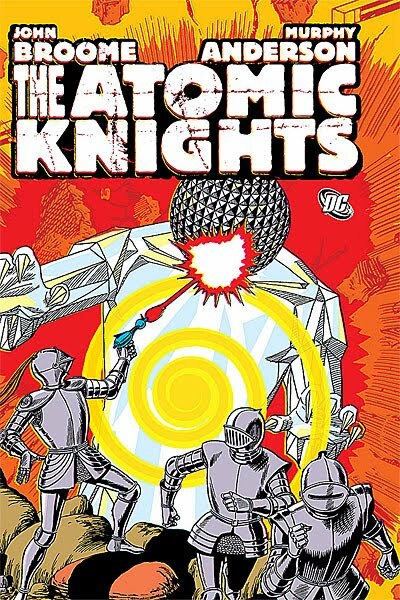 After the lucky (and improbable) discovery that old suits of plate armor protect against the radiation beams from the bad-guy's "raguns", the group becomes the Atomic Knights, and begins a quest to re-establish democracy, and civilization. 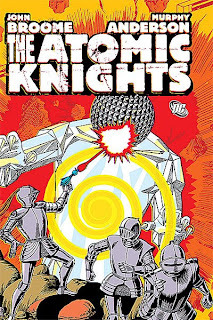 The Atomic Knights go on to have many more strange adventures in Strange Adventures, travelling across the former United States, mostly fighting the despotic forces of the fascistic Blue Belts, but also encountering aliens, mutated plants, and mole-men--you know, the post-atomic war usual suspects. Along the way they get to use giant dalmatians as mounts, and figure out an alternative, bio-fuel source for automobiles. 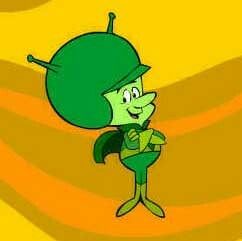 In my favorite Atomic Knights' adventure, they free all the surviving doctors from being mind-controlled thugs by bringing jazz back to New Orleans. To this end, they briefly become an Atomic Knight band and play "When the Saints Go Marching In" while marching down Bourbon Street! H-radiation, or no, is there any doubt that the fate of the America and democracy is safe in these guys' hands? 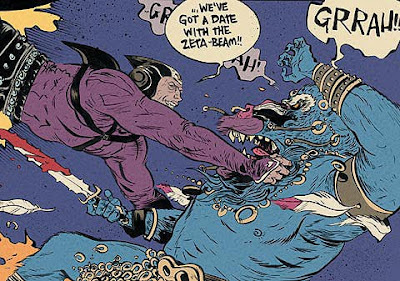 Give your post-atomic gaming a boost, or just fortify yourself with Silver Age strangeness, and check them out. All humans (and human-like beings) dream. Like "thought balloons" in a comic strip, clouds of dreamstuff float "upward" from the dreamer into the Astral Plane. There they form bubbles in the Astral substance, tethered to the dreamer until waking. These bubbles are permeable with, and ultimately dissolve into, the Dream Realm--more commonly called Slumberland or Dreamland, or sometimes the "Land of Nod" (but not this one, or this one ;) ). Given their nature, dreams represent the easiest portal for humans to cross the transitive plane of the Astral and move into the Outer Planes. Slumberland is ruled--or perhaps merely managed--by a being known by many names, but often called the Dream Lord, or Dream King. He appears as a robed humanoid figure wearing a bronze, mirrored mask. He doesn't create dreams--these come from mortal (and perhaps immortal) minds, themselves--but monitors and maintains them. His castle, with its strangely-angled, dream-logic, expressionistic architecture, sits on the border between the material and immaterial worlds, existing both in Slumberland and on the dark side of the Moon. From there, he maintains the oneironic devices, and monitors the content of the flow of dreamstuff. He strives to ensure virulent nightmares don't readily infect other dreams, and that idle fantasies don't spoil and bloat to become perverse obsessions. It's a big job, and the Dream Lord doesn't do it without help. Gnome-like creatures called "Sandmen" serve him. They carry pouches of silvery, glinting powder made from dessicated and alcehmically treated dreamstuff. They use this oneiric dust to induce sleep in a mortals, or cause waking dreams, or even to cause multiple beings to share the same dream. This is their primary tool for observing or even entering dreams--supposedly for the purposes of monitoring and testing. "Supposedly" because there is some evidence for the existence rogue Sandmen, or at least breakdowns within their system. Regrettably common are the condensed nightmares called bugbears, or sometimes "bogies" or "bogeymen." These creatures emerge from dark, foreboding places--like "haunted" houses, abandoned subway tunnels, ancient ruins, or even children's closets! They're variable in size, but usually appear slightly larger than humans. 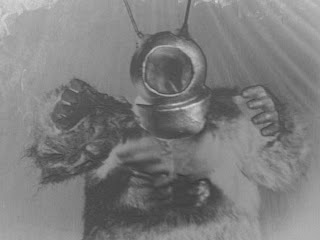 Their bodies are described as "bear-like" or "ape-like", but their heads are something like deep-sea diving helmets, albeit with blank face-plates, and strange antennae. Bugbears, as nightmares given flesh, torment humans to feed off their fear. They then employ electronic devices or machinery--with an appearance both nonsensical and menacing--to siphon oneiric potential from the minds of their victims to incubate bugbear pups. Bugbears aren't the only evidence of corruption in Slumberland. There are persist rumors of Sandmen on the take, selling blue dreams to Hell Syndicate incubi and succubi to slip to unsuspecting marks. There are also rumors of black-market Tijuana bibles produced from the concentrated salacious dreamings of certain celebrities being peddled on the streets of the City, and possibly elsewhere. Thanks to G. Benedicto at Eiglophian Press for suggesting a link between bugbears and nightmares. For reasons unknown, a person may attract the dubious attentions of an imp. Imps in the world of the City aren't devils, but rather extradimensional aliens--ultraterrestrials. Each comes to a Prme Material Plane got its own reasons, but the usual one cited by those imps who bother to give an explanation is simply, boredom. Imps vary wildly inappearance--it's likely they don't have any set physical form--but they typically manifest as diminutive humanoids of a somewhat comical aspect. They're shape-changers, though, and sometimes briefly take other forms in the course of their "games" with their human of interest. Some imps choose to present more of a technological veneer while others use the trappings of magic. 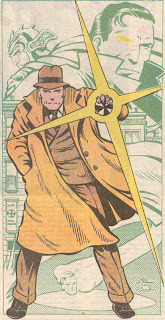 In all cases their powers are innate, and any items or tools they utilize are simply props. Imps instrisic magical ability is the power to warp reality to their whim. The range of this power is typically limited to their immediate vicinity (though since they can become invisible or incorporeal its not always easy to tell one is in the vicinity). This power is limited in some ways in regards to living beings (who always get a saving throwl). For example, they seem unable to strike a being instantly dead. They are quite capable, however, of materializing, say, a giant mallet and having it beat a person senseless. Their power can mimic most spells, but they seldom rely do anything subtlely once they reveal themselves, nor do they usually engage in mind control. Though there is no way of predicting who will attract an imp's attention, people with more interesting lives--like adventurers--are more likely to be targets. An imp often plays a series of practical jokes (whisking away needed items at inopportune times, causing communication difficulties, etc.) for a short period, before revealing themselves to their target. Some imps will profess to want to help the individual--and will in some cases appear to do so--but their involvement only leads to more complications and difficulties. Others will directly challenge the individual to some game or contest. This is more likely to be a intellectual competition, or something like a scavenger hunt of sorts, rather than a simple game of chance. Imps seldom do, "simple." Imps will never try to directly harm a target in any serious way. However, their actions may indirectly lead the target, or even innocent bystanders, to be endangered. Naturally, given the frustration imp shenanigans may cause, people often try to harm them. Imps, however, are utterly impervious to normal, physical harm. They may appear to allow themselves to be beaten or hurt, particularly in a humorous, slapstick manner--but this is only part of their games. Likewise, most human magic in incapable of directly harming them, though indirect effects, or magics that might entrap/ensnare rather than harm, can. Still, they're generally able to dispel or counter much magics, though, once again, they may wish to appear to be unable to for a time. Lesser magical creatures can harm them, though seldom seriously. Extra-planar entities of great power are certainly capable of destroying them, but imps wisely make themselves scarce when beings like that are around. Short of a Wish, there are only two sure ways for a poor human to be rid of an imp. One is to be so uninteresting that the imp will move on out of boredom. This is difficult because what bores imps vary, as does the amount of time this tactic will take. The other, surer, way is to defeat the imp at the game they've proposed. This will guarantee at least a respite while the imp vanishes from the plane to sulk. They are, after all, notorious sore losers. The City may the greatest metropolis of the strange new world, but there are other cities within the Union that have their own claims to greatness. In the western parts of the Smaragdines and beyond, to the shores of the Inland Sea, there is a loose confederation of cities and towns known as the Steel League. These form the industrial heart of the Union, refining the raw materials and manufacturing goods which are transported across the continent and worldwide. 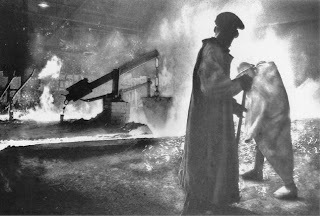 The cities of the League dominate the mass production of steel from pig iron, due to their control of the supply of salamanders. The League's salamander-wranglers--immigrants from the Old World steel-centers, decimated by war and economic hardship--jealously guard the secrets of coaxing the shy creatures from hibernation in coal, and of their care and feeding. It's steel produced in their salamander furnances that feeds the industrial production of the area, and of the entire the continent. All this metal, both in above ground factories and in underground areas where salamanders are kept and awakened from torpor, draws the attention of pests. Rust beetles--or sometimes "rust roaches"--are insects which are able to digest some metals by use of magical enzymes that hasten corrosion. Their favorite meal is iron. 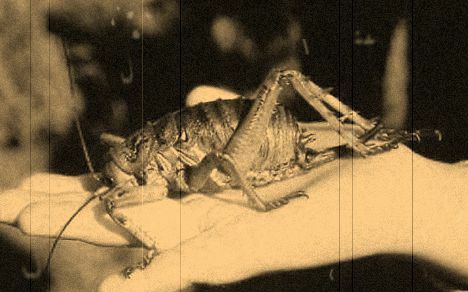 These can grow over a foot long, and may swarm like locusts. Factory owners sometimes higher adventurers to find and eradicate rust beetle nests, or to help defend against swarms. The city of Yronburg, in many ways, is representative of the Steel League, but has one feature of special note. A giant lives at the heart of the city. Inhabiting the largest steel mill is a man over ten feet tall, apparently made of steel, himself. This giant came from the Old World--though whether he is some fallen god or titan, or just the member of a lost race is unknown, perhaps even to the giant himself. Svarozic, as he's called, works tirelessly and seems impervious to heat. He does not seem to sleep, but at times goes still and appears to be at some sort of rest--sometimes for as much as weeks at the time. Luckily for Yronburg, Svarozic accomplishes enough when at work to keep them ahead in the manufacture of steel. The other steelworkers--many fellow immigrants from Ealderde--see "their" giant as a source of civic, and professional pride, and tell tall tales about his exploits. "The Quest, Part 1: Visions in a Crimson Eye"
Synopsis: In the Royal Palace of Shamballah, Travis Morgan sits alone, lost in wine and melancholy. His dark reverie is broken by a guards who demand he answer Princess Tara's summons. They soon discover why goading a drunken Warlord is not a good idea. Morgan only stops delivering the lesson with his fists when Tara yells at him to do so. Morgan admits the purposelessness of his actions, but wonders if anything has a point? After all, he killed Deimos already, but now he's back, and stolen their son. Tara reminds him that that "fairness" doesn't enter into it, and tells him she is going to find their son whether he accompanies her or not. Morgan, chastened, agrees to go with her. The two set out with Tara's trained hunting dog, Shadow. Next, we find our heroes riding through the forest approaching a strange hut. Tara says that here they will find someone who may be able to help them. As if summoned, a large black bird swoops down from overhead. It transforms before there eyes into a crone with a staff. She greets Tara and asks what brings them to the abode of Saaba. Saaba tells them her services come at a price. Morgan rashly tells her to name it. She requires they bring her the Eye of Shakakhan, god of the Tree People. In advance. With little choice, Morgan and Tara head off into the depths of the forest, where the canopy produces a foreboding gloom. Without warning, the primitive Tree People attack from the branches above. While Morgan brawls with them, Tara is lassoed. Shadow fights for her mistress, but is herself netted. Morgan is last to fall, but is finally knocked senseless, and the attackers make good their abduction of Tara. When Morgan awakens, he frees Shadow from the net. The two pursue the primitives, through the trees, running along the thick branches. Shadow tracks them easily to the entrance to a subterranean chamber in the bole of a giant tree. Inside, they find Tara tied to an altar about to be sacrificed in the rites of the Tree People to a giant wooden statue of a cyclops--Shakakhan, the forest god. Morgan puts a bullet through torso of the high priest, then he and Shadow fall upon the Tree People worshippers in a battle frenzy. Morgan cuts Tara free with the comment: "Find yourself a weapon, girl! There's killing to be done here!" She snatches up the ceremonial dagger and goes to it. Soon, the Tree People are driven off. Morgan climbs up to take the statue's red-jewelled eye. When removes he removes it from the socket, he doesn't notice that some of his blood from a small wound fall on to the idol. Suddenly, the statue comes to violent life! Blinded, the statue lashes out and hits Morgan with a glancing blow that still knocks him senseless. It gropes around sightlessly for Morgan, so Tara stabs it with the dagger to distract it. While it moves to take the dagger from its leg, Tara snatches up a nearby brazier and throws its contents at the wooden giant. Shakakhan catches fire, and Morgan and Tara make their escape. Returning to Saaba's hut, the two present her with the eye. Saying an incantation over it, she conjures within an image of Deimos in a fortress at the end of the world, in a place of half-shadow and half-light. Deimos holds Joshua overhead exults in anticipation of his vengeance. He plans to raise Joshua to despise his father and ultimately pit him against Morgan. The image fades from the jewel. 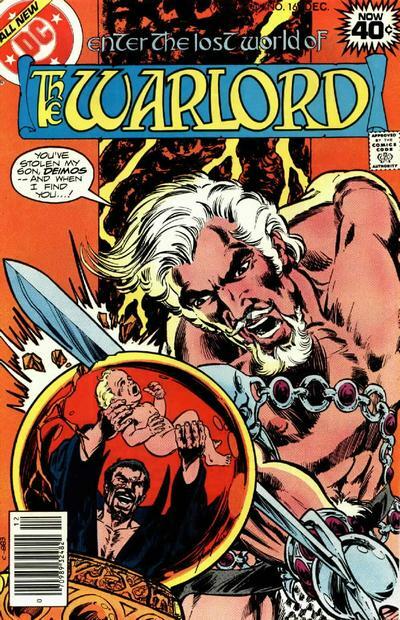 Saaba gives them one last cryptic pronouncement: "The fate of the son is the fate of the father… and the fate of the father is the fate of Skartaris! They are intertwined, inseparable!" Morgan says there's enough evil in the world, without adding to it. He shatters the eye with a shot from his pistol. This is the first chapter of the specifically labelled "Quest" storyline. This is not the last we'll see of Saaba in the Warlord saga. "Saaba" is town in Burkina Faso, though it is unclear if that's Grell's source for the witch's name here. 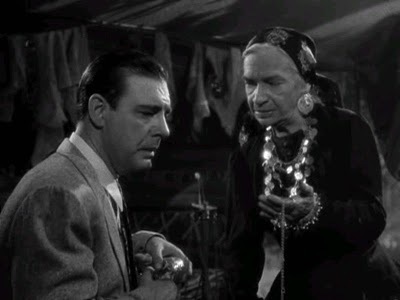 With her gypsy-ish head-scarf, I wonder if Grell had in mind the old gypsy woman of the Wolf Man (1941), but perhaps it was just the stereotypical "gypsy fortune-teller" look, in general. "Shakakhan" may have been derived from Chaka Khan (born Yvette Marie Stevens) the singer-songwriter, had been with the group Rufus previously, and had a 1978 hit song "I'm Every Woman" off her first solo album, who presumably arrived at her name by combining the name of the famour Zulu leader, Shaka, with the Altaic language family title, "khan." The statue of the god itself seems like it may be inspired at least in part by the appearance of the golem in the German silent film Der Golem--at least his hair does. 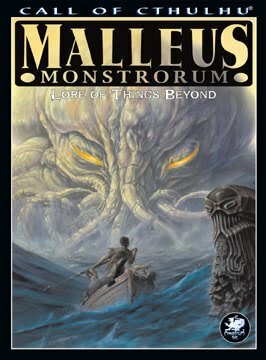 So what's your favorite monster book? I like the the original AD&D Monster Manual. Besides nostalgia, it has an amateurish sort of charm for me. The much maligned Fiend Folio is good, too. Despite the lackluster nature of some of its critters (but be fair, the Monster Manual has its share of duds, too) the art lends it a darker, more weird fiction feel I appreciate. My favorite bestiaries though, have the right combination of interesting creatures and evocative art. I even like ones for games I don't typically play if it contents are inspiring and the the artwork is good. The various iterations of the Talislanta monster compendium are cool in this regard. The creatures are often interesting, and there's that P.D. Breeding-Black art. We never got a full Jorune monster manual, which is a shame, particularly if Miles Teves had illustrated it. 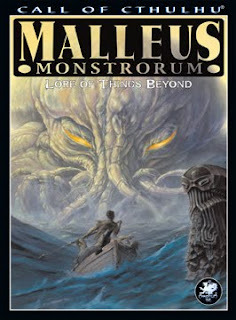 My favorite currently is probably the Malleus Monstrorum for Call of Cthulhu. It isn't the sort of thing that I steal a lot from for other games, but its just about a pitch-perfect presentation for the material. Instead of going with the typical cool illustration of a tentacled horror coming at you, it uses historical art work, vintage photos, and other pieces of "found art"--many of which are clever forgeries or manipulations. It can become a little "Where's Waldo" for the creature/entity, but that adds to the "realism" of the proceedings. It mimics exactly the "horror slowly unfolds and changes your world" ambience that Call of Cthulhu should have. 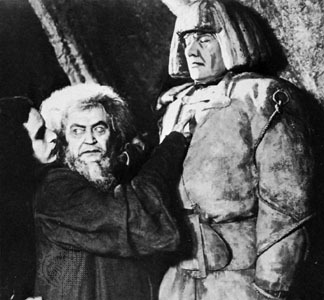 Some highlights: the photo of the de Loys ape as a member of the Martenese family, a poster for the silent movie Der König in Gelb (by Fritz Lang, no less! ), and the suggestiveness of the antique ink bottle photo next to the the Formless Spawn entry. That trick wouldn't work for every monster manual, or for every game, but I wish every one would put that level of thought into it. No outside force, not even magical threats, seem to strike as much fear into the populace of the City and its world, as the so-called Reds. These agents of a technologically advanced underground civilization seek to transform the world in their society's image, wiping out free thought and individuality in the name of their perverse vision of equality and unity. Despite their aims, their tireless machinations often dupe innocent citizens and draw them to their cause. 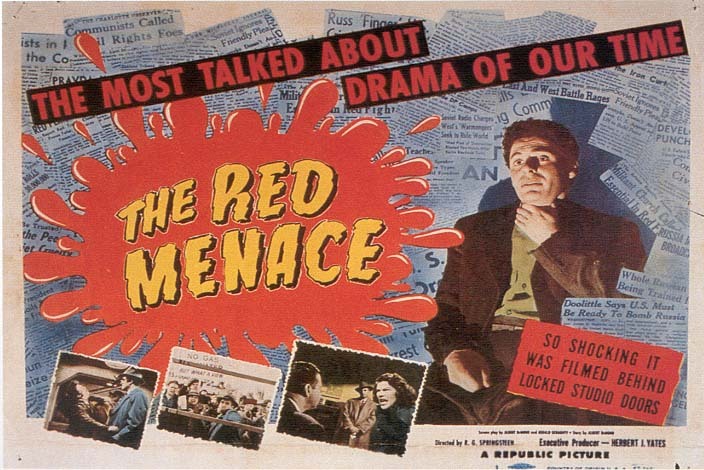 The origins of the Red menace lie with an Old Worlder named Carisdall, who returned after being presumed lost at sea with a strange story of a hidden island civilization where private property was forbidden, and everyone worked for the good of the society as a whole. The rest of his life, Carisdall tried in vain to relocate his utopia. He also wrote a manifesto describing the islander's philosophy which he termed "Communalitarianism." His work found adherents, and spawned small-scale experimental communities and political parties in several countries. The real danger came when Carisdall's philosophy began to infect the subterranean remnants of an underground civilization. Sometime during the upheaval of the Great War, the degenerate remnant of an advanced, subterranean civilization experienced a violent revolution based on these ideas. The idle, and intellectually diminished ruling class was slaughtered by the more bestial workers. The former workers sought to realize Carisdall's utopia, but in a "scientifically perfected" manner that would have likely horrified the man who inspired them. The workers began to alter themselves into different functional groups to better serve society. Then, using the thought-broadcasting machines of their ancestors, they began to subtlely influence the minds of unsuspecting surface-dwellers. The Reds (so-called because of their fondness for symbols colored a deep red) seek to transform the whole world into their sterile ordered society with the egalitarianism of the ant hill. To this end, they subvert humans to their cause--either through bribery, deception, or mind-control. There are those evil humans join the Reds, cynically hoping to enrich themselves as long possible before inevitable Red transformation. Some humans under the influence of Red thought-machines become more carnal and depraved, before finally entering into emotionally vacant, automaton-like state that is the Red's end goal. Symbol: A red clenched fist or a red five-pointed star. Special Benefits: Reds see magic as the product of decadent superstition, and disbelieve it entirely. This disbelief provides them with a degree of magical resistance, as it does their human stooges in more advanced stages of Red mental conversion (+2 to saving throws vs. spells or direct magical effects). Human in earlier stages are sometimes given technological devices by their masters that duplicate the same effect. Agents might also be loaned other technological advanced items as well, though these will always be parcelled out in a limited, efficient fashion.